I feel like this post is almost inappropriate tonight. The whole country is gearing itself up for the rugby semi-finals tonight. I’ve read online that the Rugby World Cup may be partly responsible for lowering vegetable prices – everyone is eating takeout so the demand has lessened. And then there is me – eating a salad as my main meal. 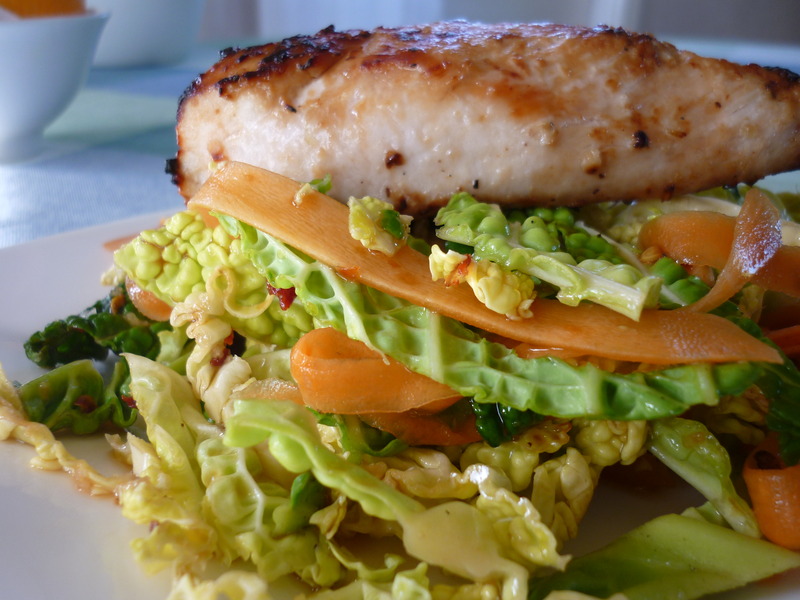 But this is no ordinary salad – this has got to be the best salad I have had this Spring. It is fresh, filling, delicious and a complete meal in a bowl. 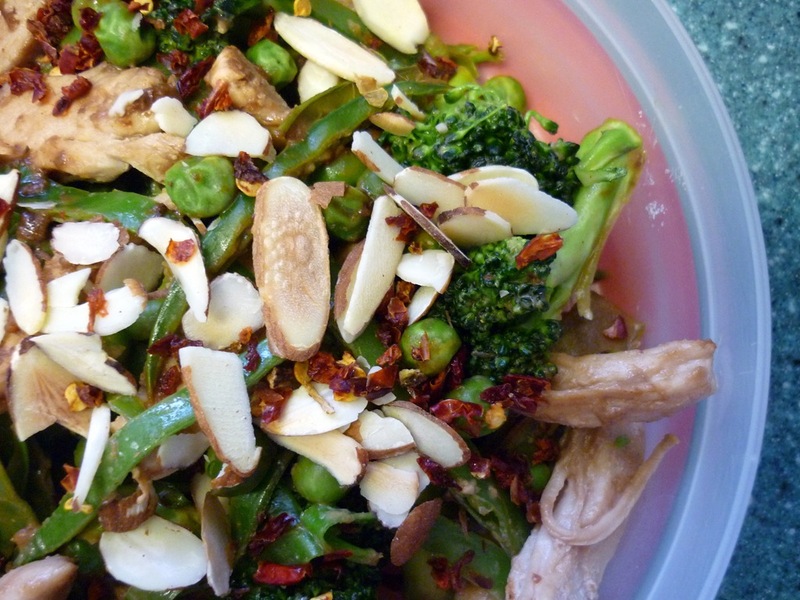 Broccoli, snow peas, peas & chicken are tossed in a tangy Asian-inspired dressing and then sprinkled with toasted almonds and cayenne pepper. Delicious. I recommend you try it! Bring chicken stock to a gentle simmer in a pot. Add chicken and cook until the chicken is cooked through. Meanwhile, slice the snow peas into strips and cut broccoli into bite sized florets. Cook peas by microwaving for 2 minutes in a tablespoon of water. Alternatively, boil in water until heated through and bring green. 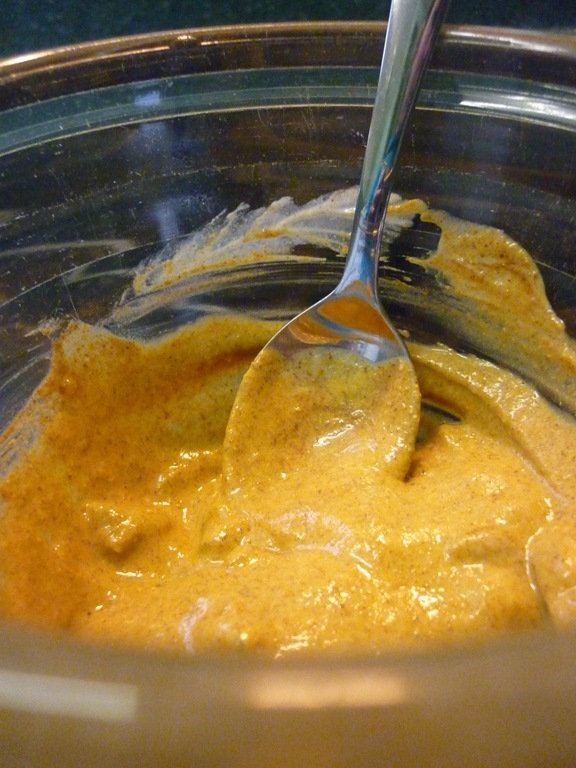 Place dressing ingredients in a bowl and whisk together until smooth, place aside. Heat 1 teaspoon of sesame oil over a moderate heat in a fry pan. Add broccoli and snow peas to fry pan. Cook for about 5 minutes until the broccoli is tender crisp and heated through. Meanwhile, drain chicken and tear into pieces. Add chicken, peas and dressing to fry pan when broccoli is cooked. Mix to combine. Serve and top with toasted almonds and dried capsicum flakes. Sprinkle with cayenne pepper if you enjoy a little heat. I have a fairly large spice and herb collection. it is wonderful. Instead of buying jars of spice pastes and sauces, I make my own. This way I don’t end up with a fridge full of half used jars designed made to feed families. 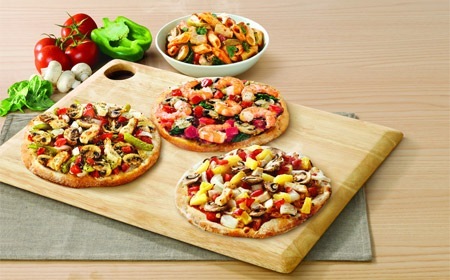 It also means I know that I am eating good, wholesome ingredients and can healthily add flavour to food. It’s an investment well worth it in my eyes. My homemade “tandoori” chicken is far from authentic but is packed with flavour and super moist (I apologise for the use of that word, but it had to be done). The chicken is marinated in spices overnight and then grilled quickly giving it a crunchy charred outer and succulent middle. 2. 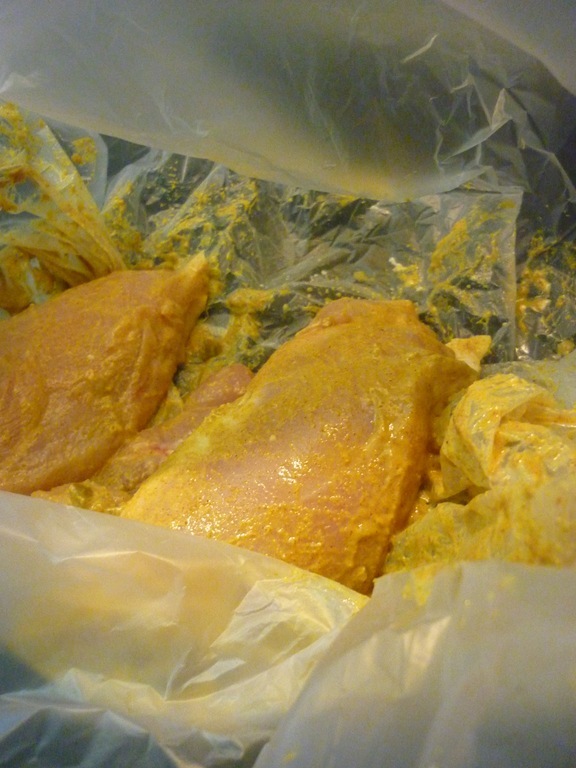 Place chicken and paste in a plastic bag and smother chicken in paste. Bash chicken with a rolling pin so that it is only 2cm at it’s thickest (try and make it even). 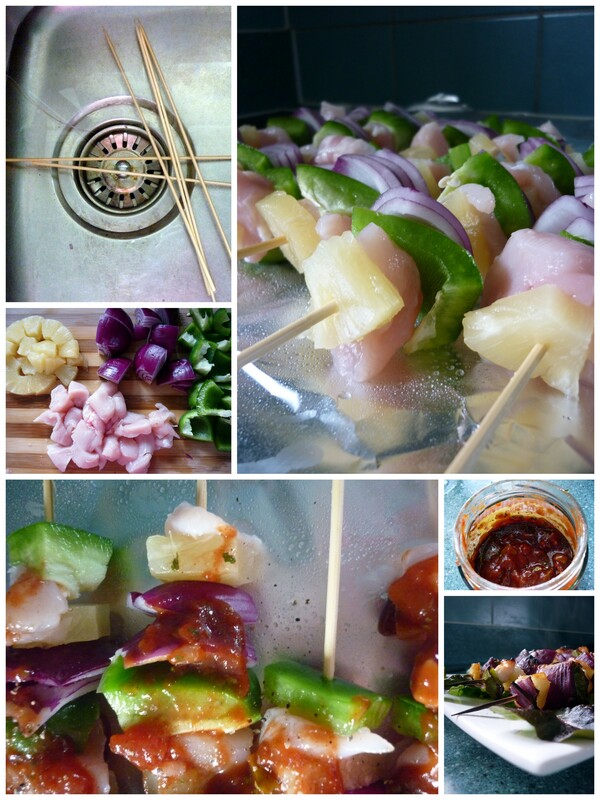 Marinate overnight for best taste. 3. 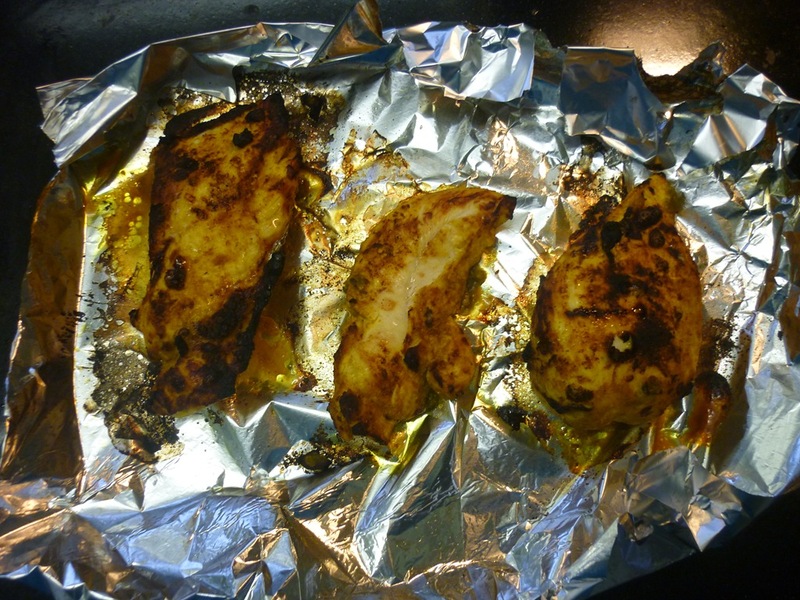 When ready to cook, line a tray with tinfoil and spray with cooking oil. 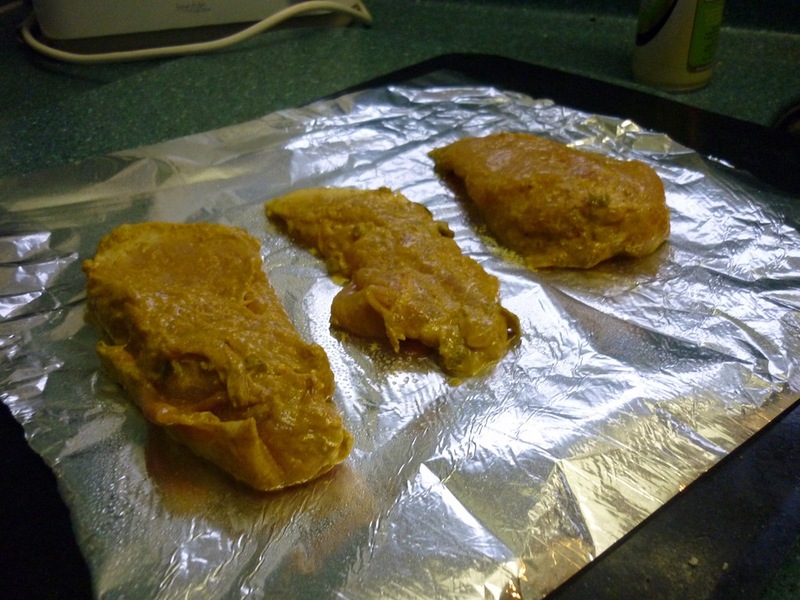 Place chicken on the tray and then lightly coat it with another layer of cooking oil. 4. Grill chicken at the top of the oven at the hottest temperature it will reach for 5 minutes on each side. Remove the chicken from the oven when it is slightly charred and cooked through. Let it rest for a few minutes before serving. I served my chicken on top of a cucumber raita with snow peas. It would also be fabulous with rice and a green salad. 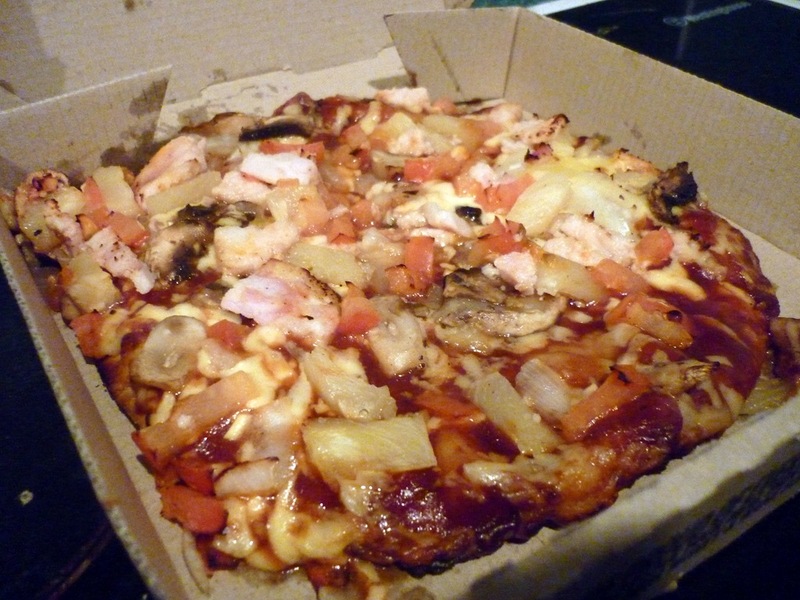 In case you can’t tell, I chose the BBQ Chicken & Mushroom Ciabatta Pizza with chicken, mushroom, fresh tomato, onion and pineapple and barbecue sauce. It looked like someone had wolfed the pizza down and regurgitated it back into the box but fortunately it didn’t taste like it. When I read that it had a ciabatta base I expected it to be soft and chewy, like ciabatta bread but the base was thin and crispy. There was a decent amount of toppings and it didn’t taste as greasy and heavy as pizza often does but I still wouldn’t describe it is very ‘nice’ and at $14.90 it certainly wasn’t cheap. Next time I’m tired and tempted to buy takeaway I think I’ll just look at the picture above and I won’t need any more motivation to get back in the kitchen! Sometimes it’s nice to be reminded that your own food is actually pretty good. I was so excited to see strawberries in the supermarket that I had to buy them. Yes, they are out of season. Yes, they are over priced but, I still couldn’t resist. Unwilling to pay the price for a full punnet, I bought a little pottle of reduced to price strawberries, and have been adding them as a small treat to my breakfast. (Sorry about the slightly blurred photo, my lens got all fogged up). I tried out Kath’s recipe for Strawberry Cheesecake Oats. For once, I actually followed the directions for a whole recipe – and it was good! The oats have milk, chia seeds, cottage cheese, banana, water and of course, strawberries added to them. The chia seeds make the oats nice and thick, binding the mixture together and the cottage cheese makes them creamy and gives a slight tang . I added almond butter on the top but sadly it was a waste of almond butter. 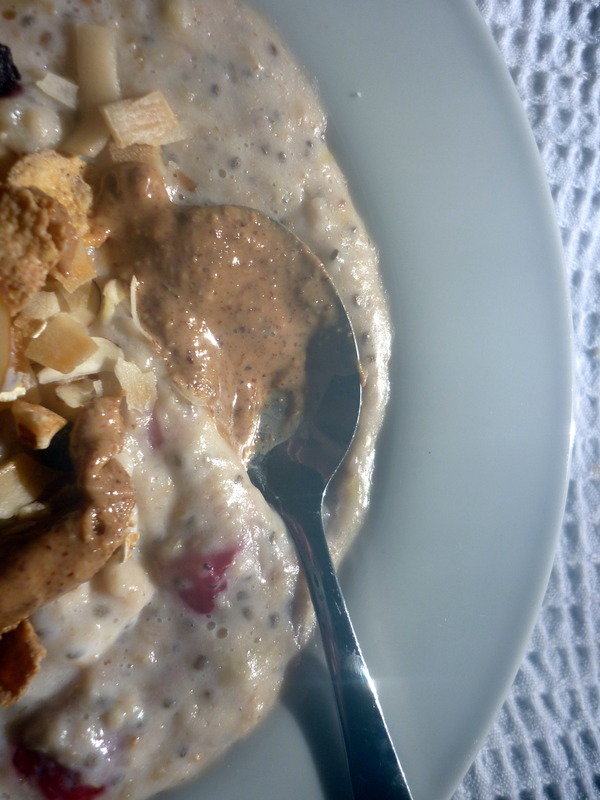 There’s something about combining the textures of hot oats and sticky nut butter that I just don’t enjoy. 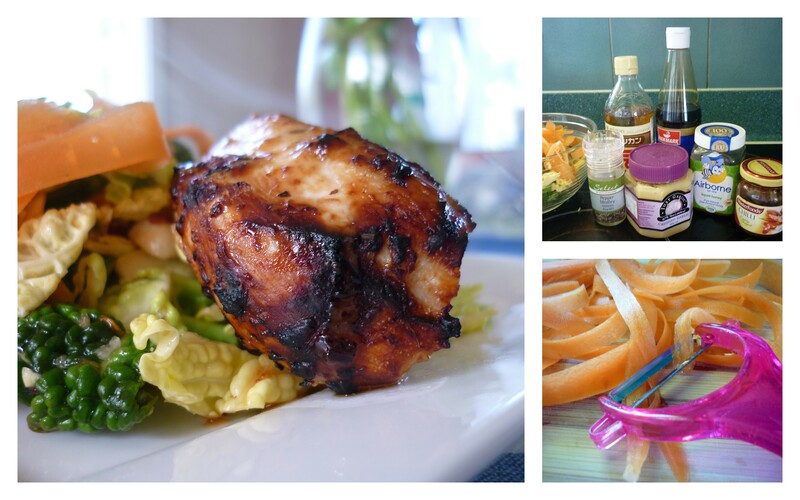 Lunch was the Healthy Food Guide’s Spring Chicken with Faith’s Sweet and Spicy Slaw. I know I’ve been saying this about a lot of recipes (ok, pretty much everything I have tried) lately but both recipes are fast, yummy and you should try them! 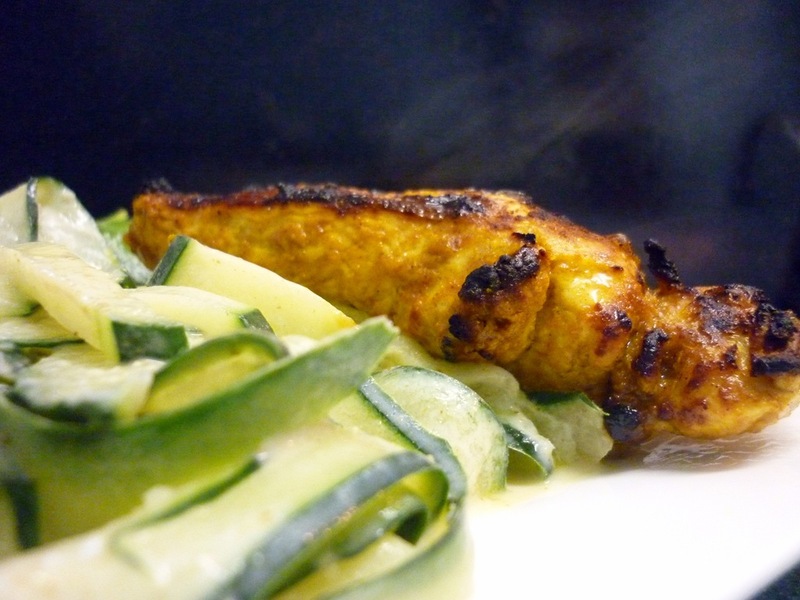 The Spring Chicken is chicken marinated in lemongrass, garlic, oyster sauce and sugar, then seasoned and grilled. Grilling is my favourite way to have chicken breast. You just crank up the oven grill as hot as it will go, spray the marinated chicken with oil and then put the chicken close under the grill for about 8 minutes (turning half way). The chicken turns out charred on the outside and moist on the inside. Rest it for a few minutes and then devour. The Sweet and Spicy Slaw was a healthier and more tastier (in my opinion) to traditional coleslaw. The dressing is rice vinegar, soy sauce, canola oil, honey, chilli and garlic but what really makes it is the dry roasted peanuts tossed through – the crunch is so good. If I were to make this meal again, the only change I would make would be to add some brown rice. Maybe it’s because I’m a carb fiend but it just didn’t seem complete. I’m not a huge meat-eater so for a meat dish to appeal to me it has to be quick, hassle-free and tasty. 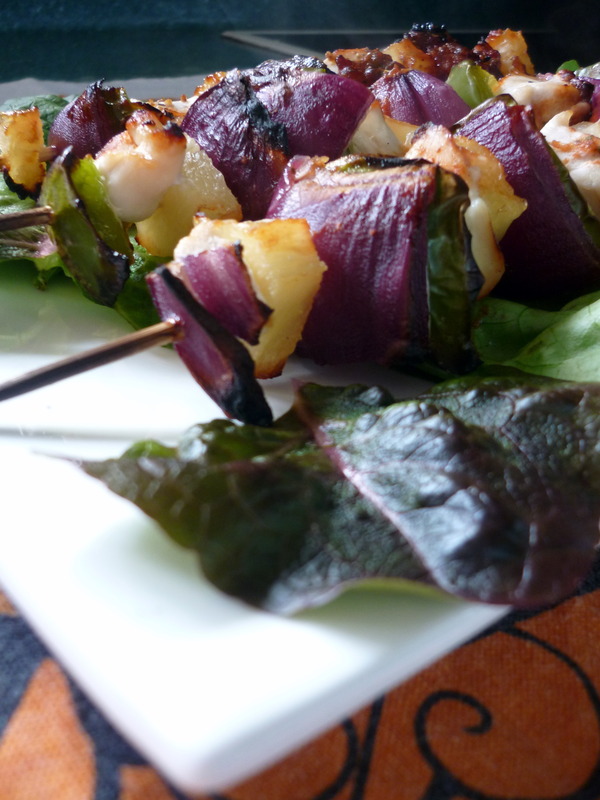 All this nice Spring weather has got me dreaming of long days outside and gatherings around the barbeque. That, and the fact I’m trying to up my lean protein intake, made this recipe from the Women’s Health Magazine appeal. I adapted the recipe to serve two and increased the amount of sauce and meat each person gets (very important!). The original recipe says that you’ll have extra sauce to serve with the kebabs but after doubling it I only just had enough to brush on the meat. This would make another quick and tasty mid-week meal. I served mine on a green salad but if you wanted a bit more of a substantial meal it would go great with rice and/or grilled veges. juice) and brush the remaining half over the kebabs.